The incoming sabbatical officers of CUSU and the Graduate Union (GU) have issued a statement condemning the University of Cambridge for its handling of the recent occupation of Greenwich House by pro-divestment student activists. The student union officer-elects called the use of force a “dangerous precedent for the suppression of students’ right to protest”, and criticised the University for using legal action rather than negotiation, demanding “that the university commit to not using the force of law to suppress protest in future”. On Friday, the University went through court proceedings to repossess the offices of Greenwich House, the location of a seven-day occupation by Cambridge Zero Carbon Society. 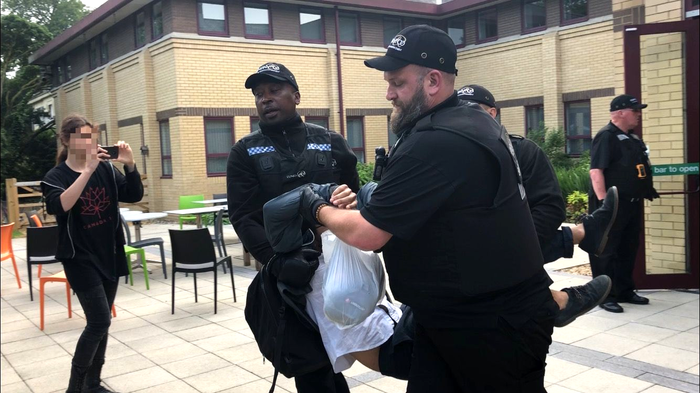 Within hours of the court’s ruling in the University’s favour, bailiffs were on site, physically carrying students out of the building. The incoming sabbatical officers are the latest in a series of student groups to criticise the University’s eviction of protesters from Greenwich House. They have demanded that the University not use the legal system to suppress protest in the future, and that it commit to not take any disciplinary action against the occupiers. Commenting on the eviction on Friday, a University spokesperson said: “The occupation of Greenwich House caused significant disruption both to the University staff who work there, and to the vital work they carry out to support research and teaching across the university. An earlier letter, signed by a number of groups, including CUSU, as well as around 130 students and academics, has similarly condemned the use of force against a “peaceful student protest”. CUSU BME Campaign have also criticised the University’s choice of bailiff agency Constant & Co., which carried out the 2011 Dale Farm evictions where around 80 families were removed from their illegally-built homes. The BME Campaign argued that it set “a dangerous precedent for the University to further securitise, surveil, and militarise the campus”.